Ashby Castle is a great English estate and is of aristocratic refinement and typical English noblemen mannerism. Ashby Castle rises majestically above the strictly arranged English garden in Northamptonshire, which is located in the southeast. Immediately next to the Castle Ashby is the historic village of the same name which was designed to serve the needs of the mansion. The village Ashby has about 134 people and only one pub, which offers several rooms for tourists in the area. The basics of Ashby Castle were made by Henry Compton, who was the first Baron of Compton, in 1574 and subsequently the property was inherited by his son, the Earl of Northampton. A curious fact in the historical record of Ashby Castle is a visit of Queen Elizabeth I, who stayed in the mansion in 1600. In the early 17th century Ashby Castle was in its heyday as a prosperous estate of King James and his wife. Documentary sources tell how Ashby Castle in 1605 had about 83 servants working in it, three music courtiers and a gardener. Today, Ashby Castle is the private property of the Earl of Compton and his family who continue to live in the castle. The palace itself is not open for public visits, but it is possible to walk around the beautiful gardens around Ashby and enjoy it only from outside, which is definitely not a small advantage. Within the property you enter a one mile long road, and a playground for cricket, which has been the love of the English aristocracy sport for centuries. From 1984 to 1992 Castle Ashby was the host of an annual Christian music festival -Greenbelt Christian music festival. 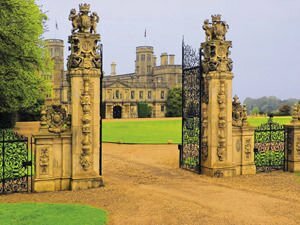 In July, 2000 the front gardens of Castle Ashby became the scene of two consecutive outdoor concerts by Sir Elton John. The palace has not lost its cultural identity as in recent years there has been exported various and traditional amateur theatrical performances, a group composed of residents of surrounding villages.